The December issue of The Fifth Di… is here. 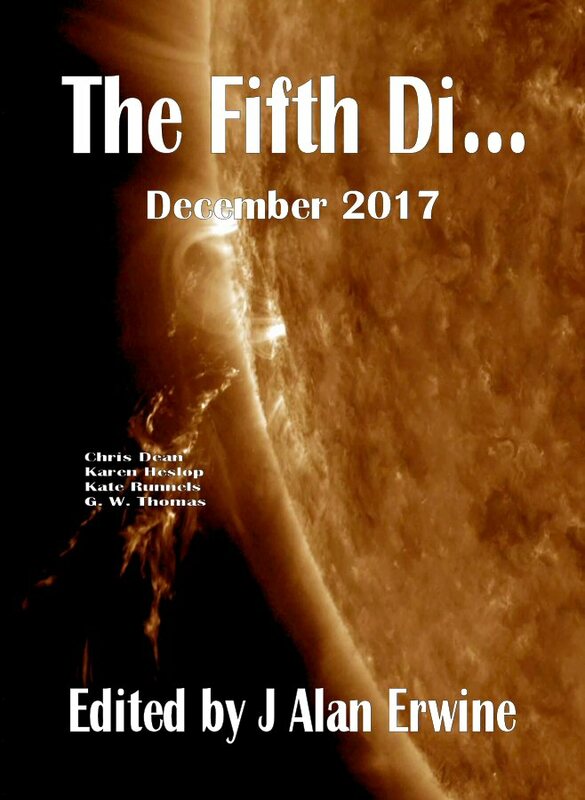 The December 2017 issue of The Fifth Di… brings you stories from Chris Dean, Karen Heslop, Kate Runnels, and G. W. Thomas. A serial killer is loose and it’s up to a psi talent to catch them, but can she hold herself together long enough to succeed? A young girl is “chosen” to sacrifice herself for the good of her village, but nothing can prepare her for what this sacrifice means. A woman is determined to continue to explore the galaxy, but the chaos of Earth is threatening to destroy her dreams, and she’s already had so many dreams destroyed. And finally, a man down on his luck finds that that luck is about to change in a way he could never expect. It's Cyber Monday, which means it's the last chance to save! Go to our store at http://nomadicdeliriumpress.com/blog/shop and use coupon code "blackfriday" at checkout to save 25%. or go to DriveThruRPG at http://www.drivethrurpg.com/browse/pub/2805/Nomadic-Delirium-Press?filters=0_0_0_0_0_44243 and save on our RPG titles. The guidelines are pretty straight-forward, we’re looking for stories of novella length. We’re mostly interested in science fiction, but we will consider fantasy. Other than that, the theme is basically up to you. All novellas will be released in both print and e-book format. Length: The SFWA defines a novella as being a story between 17,500 words and 40,000 words, and that definition works for us. If your story falls between those lengths, then you can submit it here. If not, please look at our other guidelines. Payment: We will pay $50 in advance plus 5 contributors’ copies. In addition, the author shall receive 25% of all profits made from the book…paid quarterly. Other important info: All submissions should be sent as .doc, .docx, or .rtf files. We will respond within two months. All submissions must be original works. We will not publish works based in other people’s universes…of course, a universe of your own creation is just fine. We will not consider reprints. Any questions should be directed to the submission address above. We're still a week away from the release of the December issue of The Fifth Di..., but you can order (and read) the e-book version of the zine today at http://nomadicdeliriumpress.com/blog/product/the-fifth-di-december-2017/. Not only can you read it early, but until the release date, you can download it for just $1!!! If you do order it, and you don't receive it, please contact us at editor (at) nomadicdeliriumpress (dot) com. We're still having problems with a recent "upgrade." Starting today, (Black Friday), and running through Cyber Monday, DriveThruRPG and DriveThruFiction are running a 17% off sale on all of their PDF versions of our titles. Go to http://www.drivethrurpg.com/browse/pub/2805/Nomadic-Delirium-Press?term=nomadic+&filters=0_0_0_0_0_44243&test_epoch=0 and http://www.drivethrufiction.com/browse.php?keywords=Nomadic+Delirium+Press&filters=0_0_0_0_0_45561&x=0&y=0&author=&artist=&pfrom=&pto= and start downloading your books today. Starting Black Friday, and running through Cyber Monday, we are running a Black Friday special. You can get any of our titles (print or e-book) for 25% off. That’s 25% off your entire cart. Simply go to http://nomadicdeliriumpress.com/blog/shop and start shopping now. Use coupon code "blackfriday" at checkout. As a word of warning, our Commerce program was recently “updated,” so it’s not working properly. If you get a message saying your order was canceled, it hasn’t been…you will still get your product. If you order an e-book copy, and you don’t receive it, please e-mail editor (at) nomadicderliumpress (dot) com, and we will e-mail it to you. Starting Black Friday, and running through Cyber Monday, we are running a Black Friday special. You can get any of our titles (print or e-book) for 25% off. That's 25% off your entire cart. Simply go to http://nomadicdeliriumpress.com/blog/shop and start shopping now. As a word of warning, our Commerce program was recently "updated," so it's not working properly. If you get a message saying your order was canceled, it hasn't been...you will still get your product. If you order an e-book copy, and you don't receive it, please e-mail editor (at) nomadicderliumpress (dot) com, and we will e-mail it to you. October took a toll on me. Nomadic had several book releases, we had MileHiCon, I got older, and I was putting in extra hours at the "real" job, and those hours were difficult. It's taken a real toll on me, physically, mentally, and emotionally. November has been fairly mellow so far, and I'm working on getting caught up, although my body and mind don't want to do anything. For those of you waiting on things from me, they will be coming...I promise.